Robert Gardiner Foundation Awards Navy SEAL Museum $300k Grant. Suffolk County Executive Steve Bellone and Legislator Bill Lindsay at the groundbreaking for the LT. Michael P. Murphy Navy SEAL Museum and Sea Cadet Training Facility. Suffolk County, NY - November 20, 2018 - Suffolk County Executive Steve Bellone and Legislator Bill Lindsay today announced a $300,000 grant from the Robert Gardiner Foundation as part of a groundbreaking ceremony for the LT. Michael P. Murphy Navy SEAL Museum and Sea Cadet Training Facility, the first U.S. Navy SEAL Museum in the Northeast. The ceremony featured a presentation by the Gardiner Foundation, who announced that the museum has been awarded a $300,000 grant and presented the museum trustees with a check. This funding comes on the heels of a Dormitory Authority of the State of New York (DASNY) grant from Governor Cuomo originally secured by Senator Tom Croci for $400,000. Maureen Murphy, Gold Star mother of the Navy Seal Museum’s namesake Michael P. Murphy, boarded an excavator to dig the ceremonial first bucket of dirt for the foundation of the museum. The proposed state-of-the-art facility will be constructed on the property of Charles P. Dominy Park in West Sayville. The museum will be built, and utilized in honor, and memory of LT Michael P. Murphy, a graduate of Patchogue Medford High School (Class of ’94), and Pennsylvania State University (Class of ’98). After completion of his college degree, he worked diligently to become a Navy SEAL; after years of hard work and dedication he was bestowed the honor of United States Navy SEAL Lieutenant. LT Murphy lost his life on June 28, 2005, while serving in Afghanistan. For his actions, bravery, and valor, he was posthumously awarded the Purple Heart, as well as the Medal of Honor, which quite notably made him the first member of the Navy to receive the award since the Vietnam War. The Museum is due to open November 2019. The classroom of the museum will serve as a learning center for the LT Michael P. Murphy Division of the United States Naval Sea Cadet Corps. They will continue to honor LT Murphy’s legacy by offering nautically oriented training for children between the ages of 10 and 17. They also provide education pertaining to basic seamanship and seagoing skills, and also instill a sense of patriotism and self-reliance. 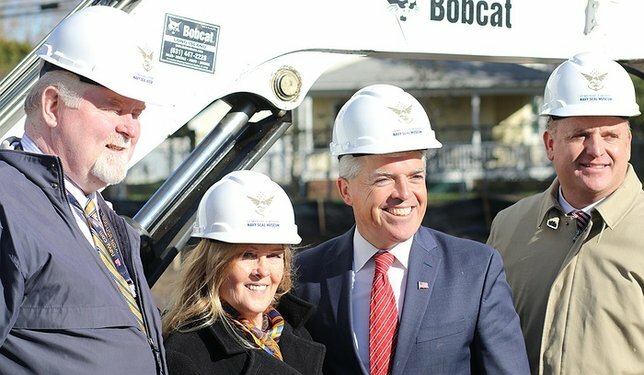 Subject: LongIsland.com - Your Name sent you Article details of "County Executive Bellone, Legislator Lindsay Break Ground for Lt. Michael P. Murphy Navy Seal Museum"